Heat oven to 350°F. Spray 12-cup fluted tube cake pan with cooking spray. Add half of the seasoning blend to rimmed baking pan or shallow dish. Remove dough from one can; do not unroll. Roll outside of dough (except for the ends) in seasoning blend; place on one side of cake pan. Repeat for remaining seasoning and can of dough, placing dough on other side of cake pan. Pinch both ends of dough firmly together to seal into 1 ring. Bake 33 to 38 minutes or until golden brown. Cool slightly, about 10 minutes. Remove bread from pan to cooling rack to cool completely, about 30 minutes. With serrated bread knife, carefully slice bread in half horizontally; place halves on cutting board. Pinch or tear bread from top and bottom halves, leaving about 1/2-inch shell; discard or save bread pieces for another use. In 10-inch nonstick skillet, melt butter over medium heat; tilt pan to coat. Pour eggs into skillet. Cook until firm but still moist, stirring occasionally from outside edge to center, allowing uncooked egg to flow to bottom of skillet. Top eggs with Cheddar cheese. 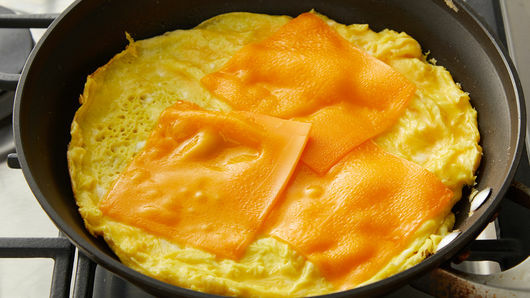 Remove from heat; cover skillet to melt cheese. 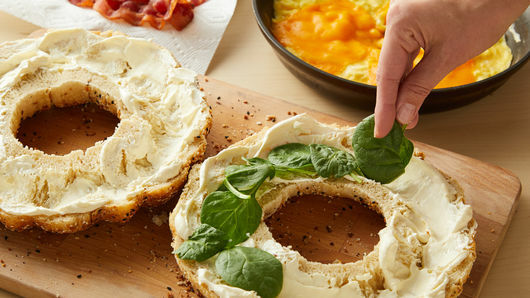 Carefully spread cream cheese on cut sides of top and bottom of bread rings. Place bacon on top ring; press lightly into cream cheese. Place spinach on bottom ring; top evenly with egg and cheese. 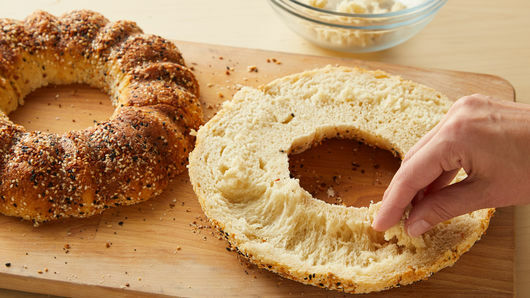 Carefully replace top bread ring; lightly press. With serrated bread knife, cut into 8 wedges to serve. Everything bagel seasoning can be purchased in a jar. However, it’s also easy to make at home! Mix 4 teaspoons each of dried chopped onion, dried minced garlic, poppy seed and sesame seed with 2 tablespoons kosher salt. Any leftover seasoning mix can be stored covered in small jar or resealable food-storage plastic bag to be used on everything from scrambled eggs to cooked vegetables. Precooked, packaged bacon can be found next to the deli meats in the refrigerated section of the grocery store. Precooked bacon is convenient in this recipe because it eliminates the mess of having to cook your own bacon. However, you can cook your own if you’d like, or use leftover cooked bacon. 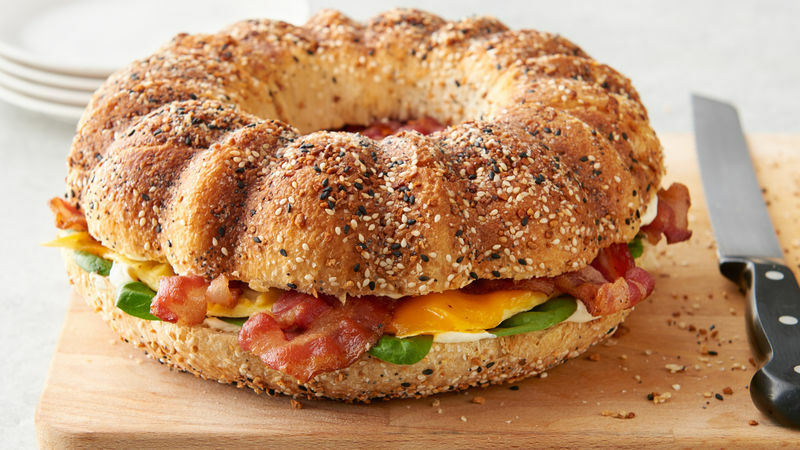 For a plain-bagel version of this breakfast sandwich, omit the seasoning blend coating.